Download "Join the Mobile Marketing Revolution...it is HERE! 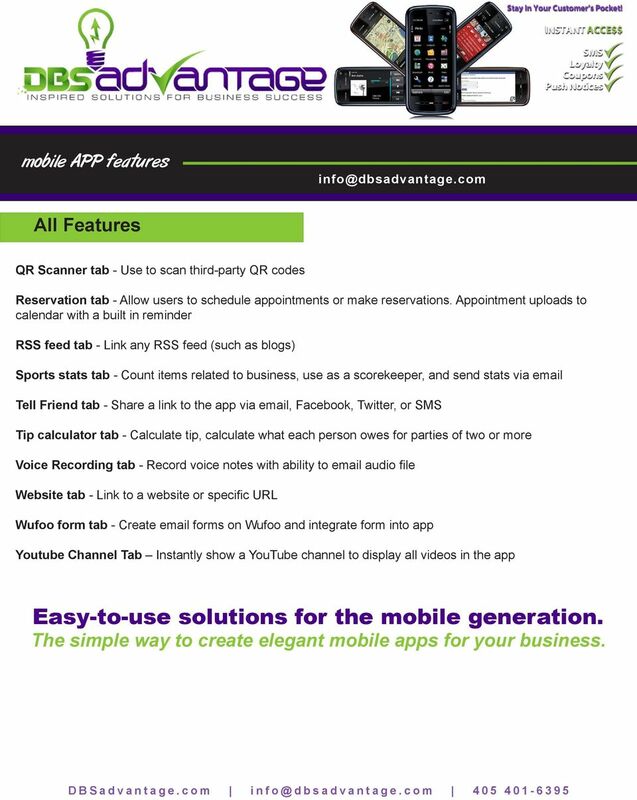 Your customer has gone mobile, have you?" 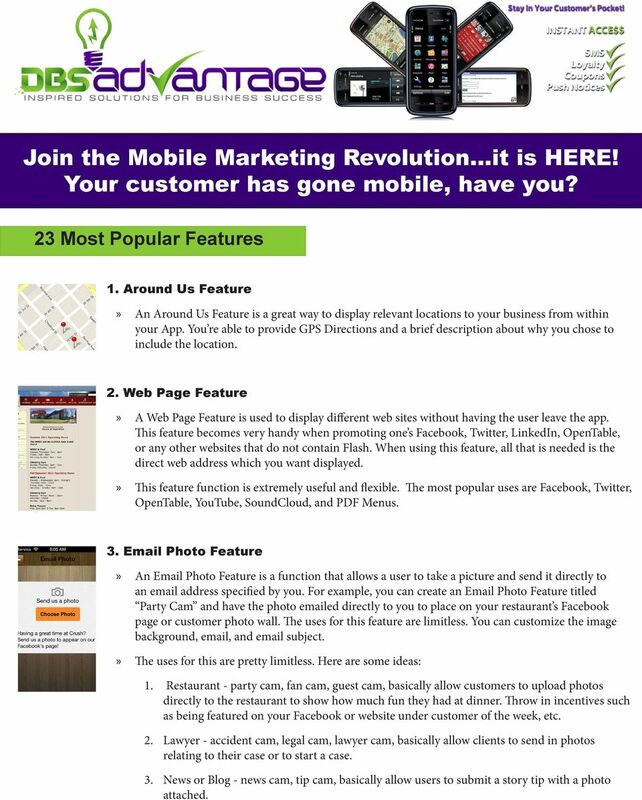 1 Join the Mobile Marketing Revolution...it is HERE! Your customer has gone mobile, have you? 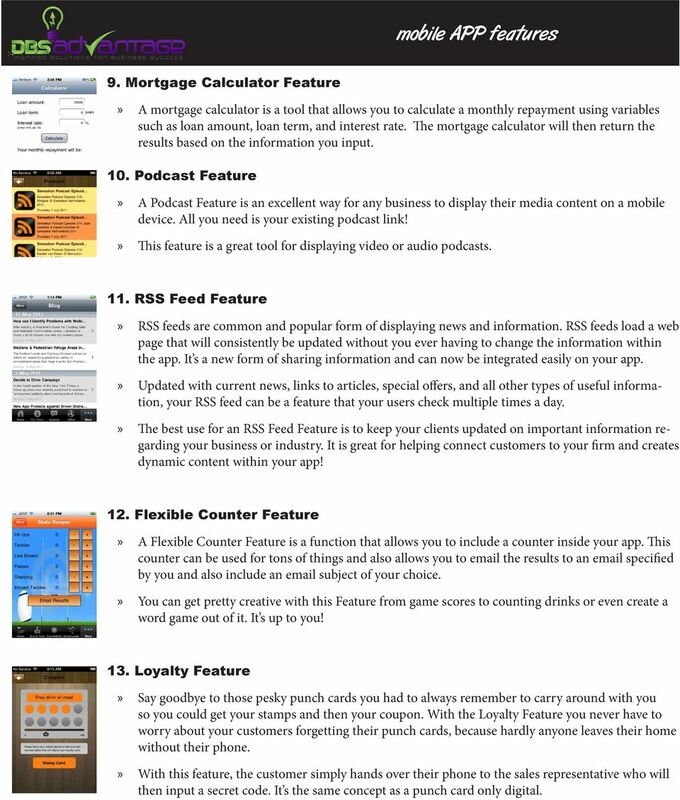 23 Most Popular Features 1. Around Us Feature An Around Us Feature is a great way to display relevant locations to your business from within your App. You re able to provide GPS Directions and a brief description about why you chose to include the location. 2. Web Page Feature A Web Page Feature is used to display different web sites without having the user leave the app. This feature becomes very handy when promoting one s Facebook, Twitter, LinkedIn, OpenTable, or any other websites that do not contain Flash. When using this feature, all that is needed is the direct web address which you want displayed. This feature function is extremely useful and flexible. The most popular uses are Facebook, Twitter, OpenTable, YouTube, SoundCloud, and PDF Menus. 3. Photo Feature An Photo Feature is a function that allows a user to take a picture and send it directly to an address specified by you. For example, you can create an Photo Feature titled Party Cam and have the photo ed directly to you to place on your restaurant s Facebook page or customer photo wall. The uses for this feature are limitless. You can customize the image background, , and subject. The uses for this are pretty limitless. Here are some ideas: 1. Restaurant - party cam, fan cam, guest cam, basically allow customers to upload photos directly to the restaurant to show how much fun they had at dinner. Throw in incentives such as being featured on your Facebook or website under customer of the week, etc. 2. Lawyer - accident cam, legal cam, lawyer cam, basically allow clients to send in photos relating to their case or to start a case. 3. News or Blog - news cam, tip cam, basically allow users to submit a story tip with a photo attached. 2 4. GPS Coupons The GPS Coupon Feature is a way for businesses to reward frequent customers with incentives for repeat business. It works by reading the mobile phone s GPS coordinates and then checks to see if they are at the same coordinates as your business s location! When they accumulate enough check-ins, they get their check-in incentive (i.e. free drinks, food, discount, etc!). You get to set how many check-ins are needed to unlock your incentive and how many hours or days before they are allowed to check in once again. The best uses of a check-in system are to build loyalty with customers and also to offer an incentive program for repeat business. Also, no more dealing with hole-punched paper cards! Let the customer do it themselves through the check-in system! One of the most important things for small businesses is to create customer loyalty and brand recognition. The best way to do this is to offer incentives for loyal customers, who will turn into brand advocates and help you grow through word-of-mouth marketing! 5. WuFoo Feature Wufoo forms are a breakthrough in online form submission. When you are looking for your customers to submit clean, to-the-point forms with ease, DBSadvantage with Wufoo has you covered. From quote forms, consultation forms, comments/suggestion forms, and submission of contact information, Wufoo has the technologies to customize the data you need to turn it into useful information. 6. Image Gallery Feature The Image Gallery Feature is a native view of images on your mobile device. This is an awesome way to display just about any images of your business inside your app. Highly recommended for apps with a large amount of photos to display. Integrate your already existing Flickr account into our native Image Gallery Feature! 7. Music Feature The music Feature is a great way to play music and sell tracks via itunes inside your app. 8. 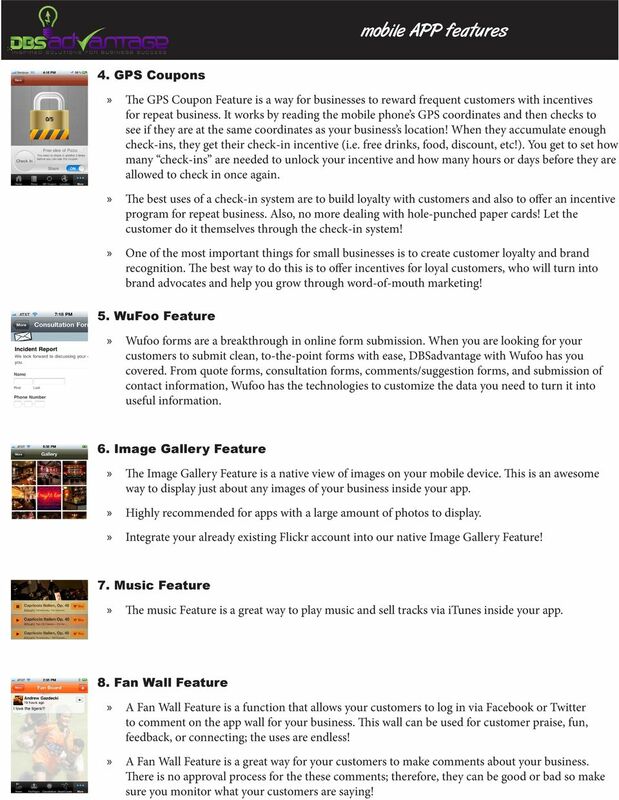 Fan Wall Feature A Fan Wall Feature is a function that allows your customers to log in via Facebook or Twitter to comment on the app wall for your business. This wall can be used for customer praise, fun, feedback, or connecting; the uses are endless!»» A Fan Wall Feature is a great way for your customers to make comments about your business. There is no approval process for the these comments; therefore, they can be good or bad so make sure you monitor what your customers are saying! 3 9. Mortgage Calculator Feature A mortgage calculator is a tool that allows you to calculate a monthly repayment using variables such as loan amount, loan term, and interest rate. The mortgage calculator will then return the results based on the information you input. 10. 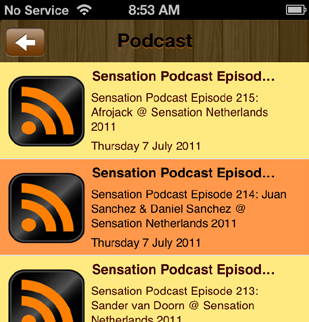 Podcast Feature A Podcast Feature is an excellent way for any business to display their media content on a mobile device. All you need is your existing podcast link! This feature is a great tool for displaying video or audio podcasts. 11. RSS Feed Feature RSS feeds are common and popular form of displaying news and information. RSS feeds load a web page that will consistently be updated without you ever having to change the information within the app. It s a new form of sharing information and can now be integrated easily on your app. Updated with current news, links to articles, special offers, and all other types of useful information, your RSS feed can be a feature that your users check multiple times a day. The best use for an RSS Feed Feature is to keep your clients updated on important information regarding your business or industry. It is great for helping connect customers to your firm and creates dynamic content within your app! 12. Flexible Counter Feature A Flexible Counter Feature is a function that allows you to include a counter inside your app. This counter can be used for tons of things and also allows you to the results to an specified by you and also include an subject of your choice. You can get pretty creative with this Feature from game scores to counting drinks or even create a word game out of it. It s up to you! 13. 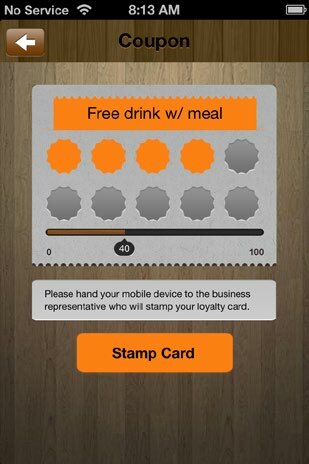 Loyalty Feature Say goodbye to those pesky punch cards you had to always remember to carry around with you so you could get your stamps and then your coupon. With the Loyalty Feature you never have to worry about your customers forgetting their punch cards, because hardly anyone leaves their home without their phone.»» With this feature, the customer simply hands over their phone to the sales representative who will then input a secret code. It s the same concept as a punch card only digital. 4 14. 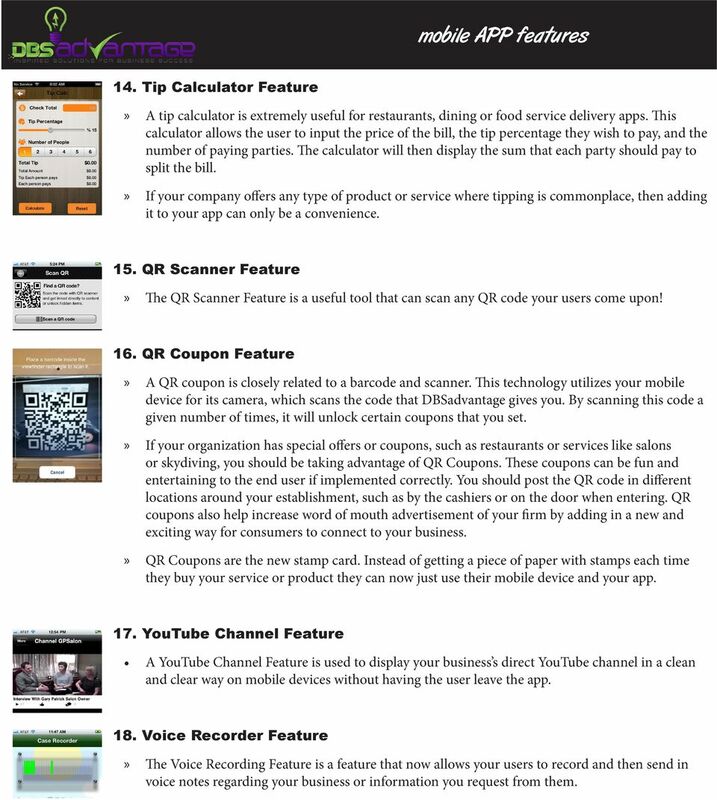 Tip Calculator Feature A tip calculator is extremely useful for restaurants, dining or food service delivery apps. This calculator allows the user to input the price of the bill, the tip percentage they wish to pay, and the number of paying parties. The calculator will then display the sum that each party should pay to split the bill. If your company offers any type of product or service where tipping is commonplace, then adding it to your app can only be a convenience. 15. QR Scanner Feature The QR Scanner Feature is a useful tool that can scan any QR code your users come upon! 16. 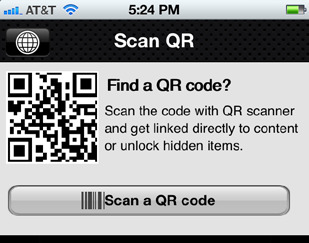 QR Coupon Feature A QR coupon is closely related to a barcode and scanner. 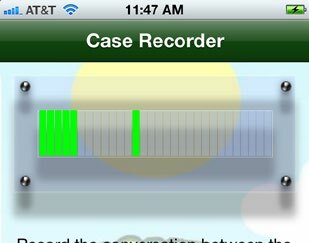 This technology utilizes your mobile device for its camera, which scans the code that DBSadvantage gives you. By scanning this code a given number of times, it will unlock certain coupons that you set. If your organization has special offers or coupons, such as restaurants or services like salons or skydiving, you should be taking advantage of QR Coupons. These coupons can be fun and entertaining to the end user if implemented correctly. You should post the QR code in different locations around your establishment, such as by the cashiers or on the door when entering. QR coupons also help increase word of mouth advertisement of your firm by adding in a new and exciting way for consumers to connect to your business. QR Coupons are the new stamp card. Instead of getting a piece of paper with stamps each time they buy your service or product they can now just use their mobile device and your app. 17. YouTube Channel Feature A YouTube Channel Feature is used to display your business s direct YouTube channel in a clean and clear way on mobile devices without having the user leave the app. 18. Voice Recorder Feature The Voice Recording Feature is a feature that now allows your users to record and then send in voice notes regarding your business or information you request from them. 5 19. 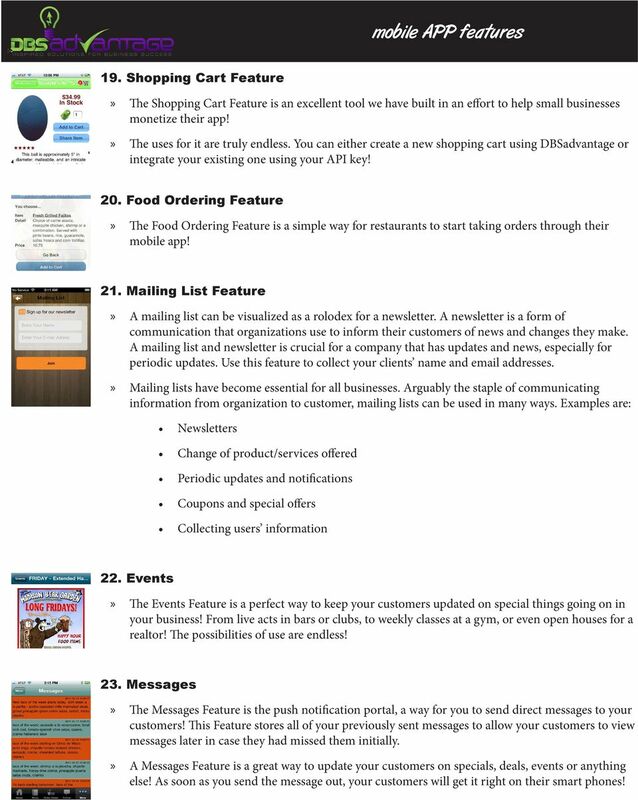 Shopping Cart Feature The Shopping Cart Feature is an excellent tool we have built in an effort to help small businesses monetize their app! The uses for it are truly endless. You can either create a new shopping cart using DBSadvantage or integrate your existing one using your API key! 20. Food Ordering Feature The Food Ordering Feature is a simple way for restaurants to start taking orders through their mobile app! 21. Mailing List Feature A mailing list can be visualized as a rolodex for a newsletter. A newsletter is a form of communication that organizations use to inform their customers of news and changes they make. A mailing list and newsletter is crucial for a company that has updates and news, especially for periodic updates. Use this feature to collect your clients name and addresses. Mailing lists have become essential for all businesses. Arguably the staple of communicating information from organization to customer, mailing lists can be used in many ways. Examples are: Newsletters Change of product/services offered Periodic updates and notifications Coupons and special offers Collecting users information 22. Events The Events Feature is a perfect way to keep your customers updated on special things going on in your business! From live acts in bars or clubs, to weekly classes at a gym, or even open houses for a realtor! The possibilities of use are endless! 23. Messages The Messages Feature is the push notification portal, a way for you to send direct messages to your customers! This Feature stores all of your previously sent messages to allow your customers to view messages later in case they had missed them initially.»» A Messages Feature is a great way to update your customers on specials, deals, events or anything else! As soon as you send the message out, your customers will get it right on their smart phones! Mobile App Proposal 1-404-468-6325. - ReXpuestas - DeMarus@PHreshApps.com. April 16, 2014 http://phreshapps.com/rexpuestas-app/ Direct Contact. The majority of consumers now own a Smartphone and are starting to expect businesses they use to have an App. Apps VS Mobile Websites. Which is better? Navigating the Web: Are You Missing The Boat? Here are our Local Buzz Services Packages designed to help your business succeed further. 72% of the population now owns a smart phone* * In the under 35 s it is now 89% (Stats from Deloite) You need an App A brief guide to affordable Apps Mobile Marketing is the most powerful media ever invented! Changing The Face! Of Business! (Websites & Mobile Apps)! With your membership mix & match any combination below to create your App.